A human rights group says it hopes the legislation isn’t an attempt to create a post-Brexit “fortress UK”. Members of the PSNI and the Gardai stand exactly on the border in Belleek, Co Fermanagh. 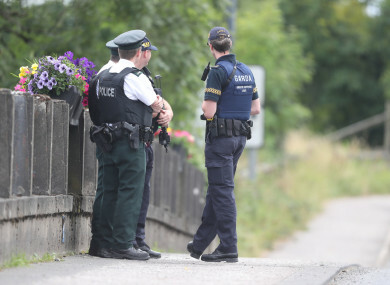 CONTROVERSIAL LEGISLATION WHICH would allow for members of the public to be stopped, searched and detained a mile inside the Northern Ireland border has sparked outcry from political parties and human rights groups. The Counter-Terrorism and Border Security Bill is currently working its way through Westminster. It is intended to bolster current UK counter-terrorism legislation and will give new powers to police and customs and immigration officers along the border. If the bill passes into law any member of the public could be stopped within a mile of the border so authorities could check if they are entering or leaving Northern Ireland. Parts of the town of Strabane in Co Tyrone would fall into the one-mile zone as would out-lying parts of Derry. This would allow authorities to enforce the powers at Newry train station, around 10 km from the border. The SDLP blasted the proposals as a “grotesque assault on border life”. The UK government appear to neither care nor understand the anxiety they are causing here. At this point in the Brexit negotiations there is very little we could put past this government who seem prepared to sign up to almost anything in the name of Brexit, and oblivious to the tension these proposals create. The proposals have also been criticised by human rights groups. The Committee on the Administration of Justice (CAJ) says it hopes the bill is not an attempt to create a post-Brexit “fortress UK”. The group says there are many objections to the content of the bill from a human rights perspective. Will there be a kind of militarised zone along the Border, where roving patrols can stop and question any person, resident or traveller, without any kind of justification? The CAJ concluded that there is no need for the powers to be introduced in Northern Ireland and the legislation should not be passed. Email “Bill proposing mile-wide stop and search zone along Northern Ireland border causes outcry”. Feedback on “Bill proposing mile-wide stop and search zone along Northern Ireland border causes outcry”.